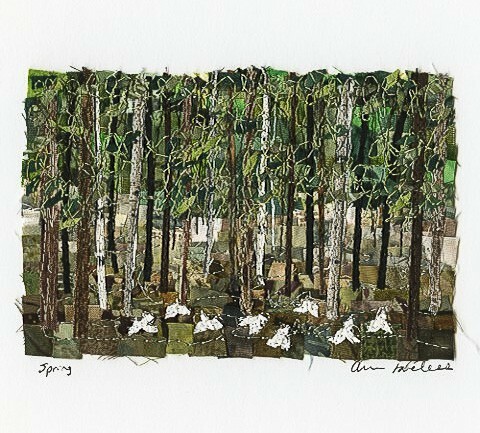 We will make a 7 inch x 10 inch “spring” fabric mosaic landscape art quilt. It will involve cutting and fusing fabrics to create a background. It will be free-motion machine quilted. Additional fusing and cutting of trees, flowers and leaves will create a beautiful spring woodland scene. ½ yard of steam-a-seam fusible web (or 1 pkg. of “sheets”); If you can not fine steam-a-seam pellon fusible web is second choice from JoAnns. Various machine embroidery threads: light green, black, dk. Brown, gray, white ,med. green, bright green, yellow. Variegated threads are great. 60 wt. bobbin thread to match backing or gray. Or whatever works best in your machine. Bring cotton scraps: batiks are great, variety rather than quantity. Ann will provide photo to work from.